I just wanted to praise the work by Dr. Rachel today. I'm visiting from Cincinnati and had a portion of my wisdom tooth break off. I was fortunate that she had an opening on her schedule. The work was efficient and very professional. Within an hour, I was on my was with no pain and believing that I had made the right choice in an emergency dental situation. I would highly recommend her! Everyone, at some point, will need the services of a dentist. When that day comes, we hope they are caring, competent and skilled. My dentist, Dr. Rachel Holm, combines all three into her dental practice. Additionally her chair-side manner is always comforting. 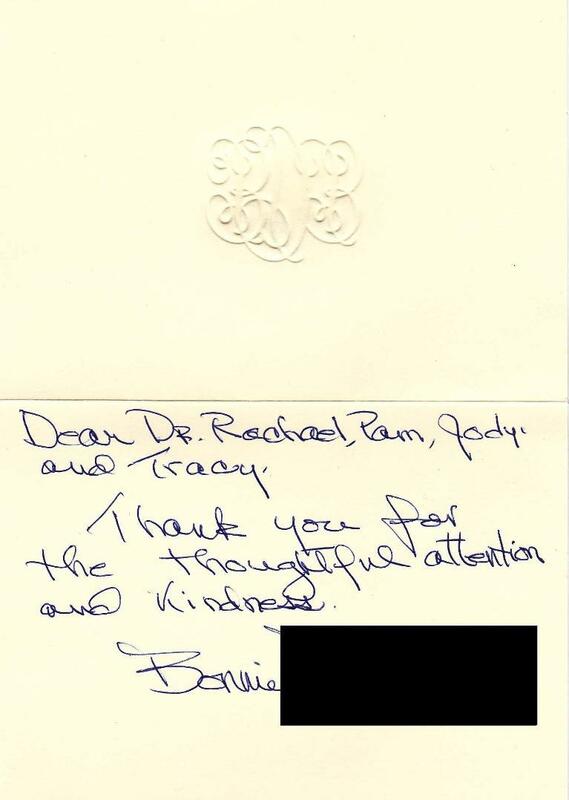 After a crown and three fillings, I can honestly say I've never before received such expert and compassionate care. If you are searching for a dentist for yourself or a loved one, search no further. No one enjoys the dentist, but Dr. Anderson, Dr. Flynn and Dr. Holm make this a much more pleasant experience! I've been coming here since I was a kid and there are so many reasons why. Everyone here is so friendly, professional and helpful. 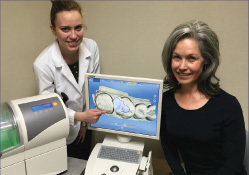 Thank you Dr.s Anderson, Flynn and Holm for all you do and excellent service! I am so impressed with all your staff at 50th and France Dental Care. Tracy, the hygienist, is awesome. I believe the care she delivers is top-notch. I actually enjoy going to my dental appointments now. I will continue to tell my friends about your office. Thank you for the great dental care and for making my visits comfortable! Let's face it, going to the dentist is not something we are programmed to look forward to. But........ from the minute you step in the door of 50th and France dental care it is a pleasant and efficient experience. Each staff member is friendly, and obviously happy to be there. The puzzles on the ceiling are a nice distraction to concentrate on rather than the purpose of your appointment. The gentle care and state of the art technology makes you comfortable and confident that you are in the best place for your dental care!!! I cannot imagine any better dental care in our area than 50th and France Dental Care. When I started with the group almost 20 years ago I felt I had taken good care of my teeth. I could not have imagined the professionalism, technology and expertise that I have continued to receive from the entire group. Besides being the best of the best they offer a friendly and courteous atmosphere. They are always available when I need them. I highly recommend 50th and France Dental Care. 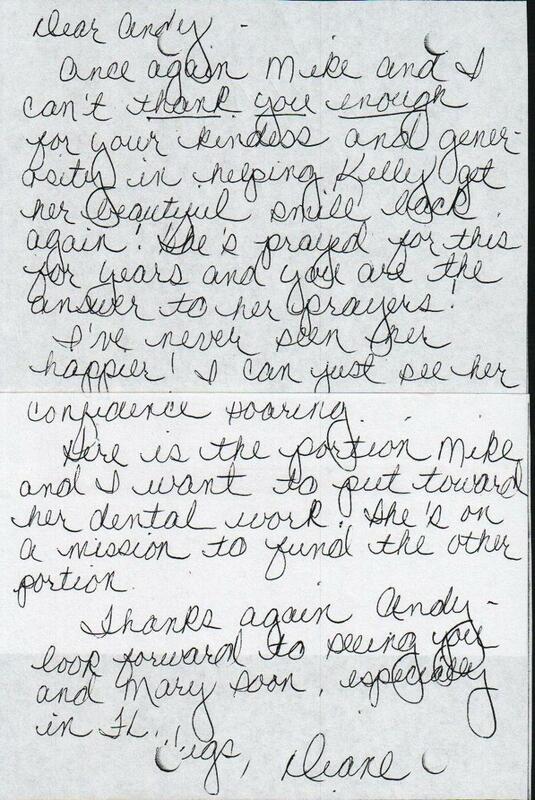 Once again Mike and I can't thank you enough for your kindness and generosity in helping Kelly get her beautiful smile back again! She's prayed for this for years and you are the answer to her prayers! I've never seen her happier! I can just see her confidence soaring. 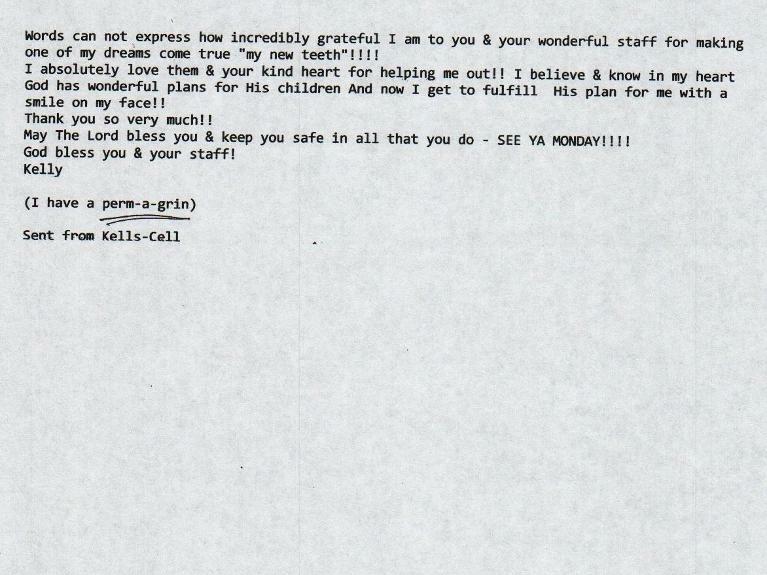 Here is the portion Mike and I want to put toward her dental work. She's on a mission to fund the other portion. Thanks again Andy -- look forward to seeing you and Mary soon, especially in FL. Thank you so much for helping me get the cavity filled. I'm so happy that it's done! I really appreciate your help and patience. 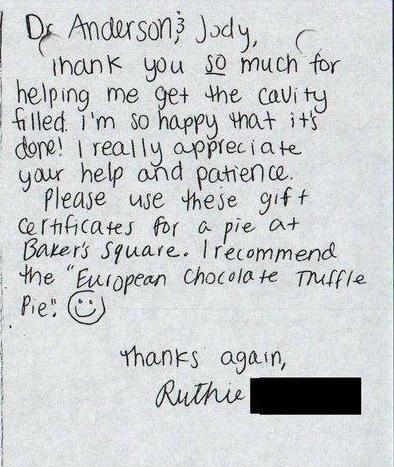 Please use these gift certificates for a pie at Baker's Square. I recommend the "European Chocolate Truffle Pie." Rick finished 30 radiations and 5 sessions of Chemo last week, now he's working at getting his health back. We'll know results on Aug 5th. 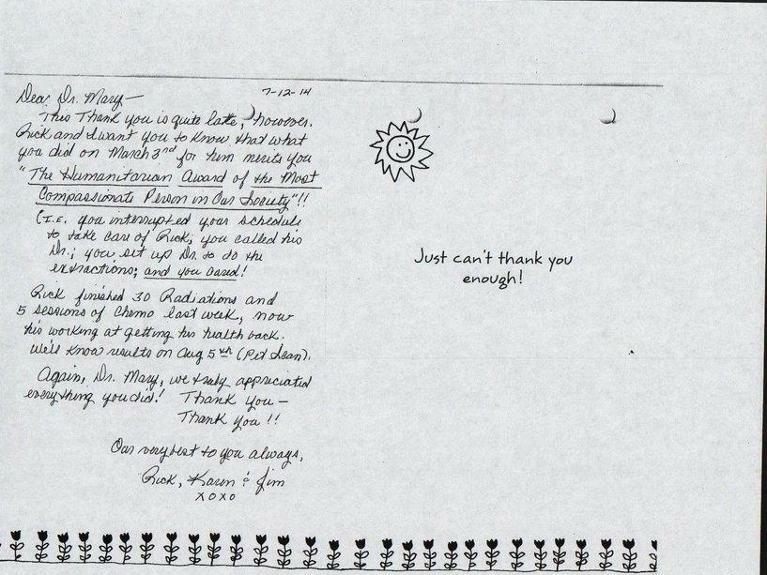 Again, Dr. Mary, we truly appreciated everything you did! Thank you - Thank you!! 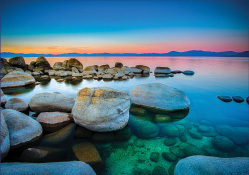 Trust, integrity, and expertise characterize your Dental practice and family. I have experienced several serious dental procedures, due to early life lapses in care. Your family practice has handled these problems with exceptional care and improved my dental health. I especially remember an 8 A.M. Sunday crisis as an example. Thanks! They always take the time to make sure you understand and feel comfortable. 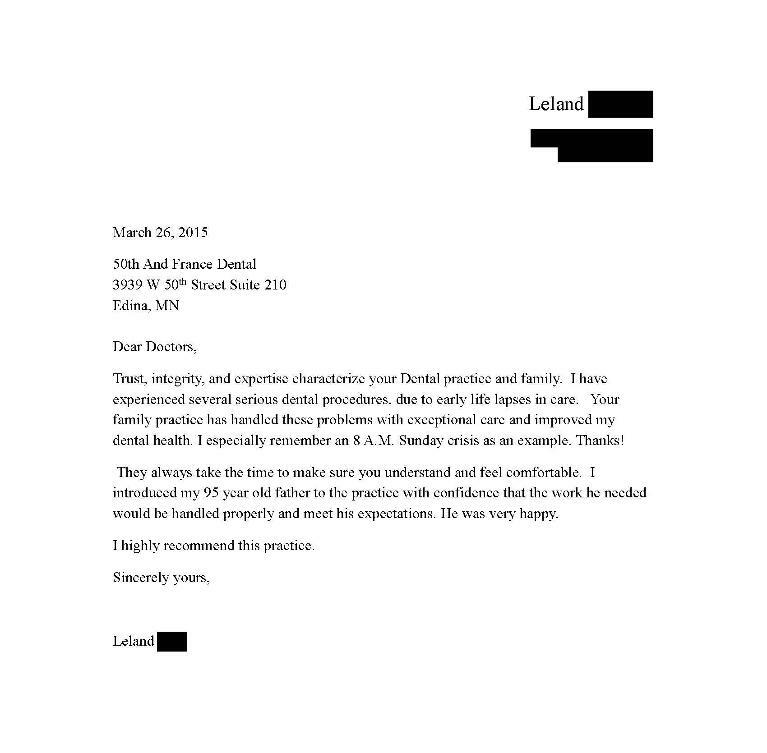 I introduced my 95 year old father to the practice with confidence that the work he needed would be handled properly and meet his expectations. He was very happy. Dr. Mary Flynn and her 50th and France dental team have impressed me with their service. I had recently been examined by a dentist at a competing facility, and had my teeth cleaned by a dental hygienist. Both of them were new to me as my previous providers had relocated to another facility too distant to be convenient for me. The exam and the cleaning were performed with little comment, and I was encouraged by them to make an appointment with a periodontist to consider deep cleaning and/or surgery for the deep pockets around many of my teeth. 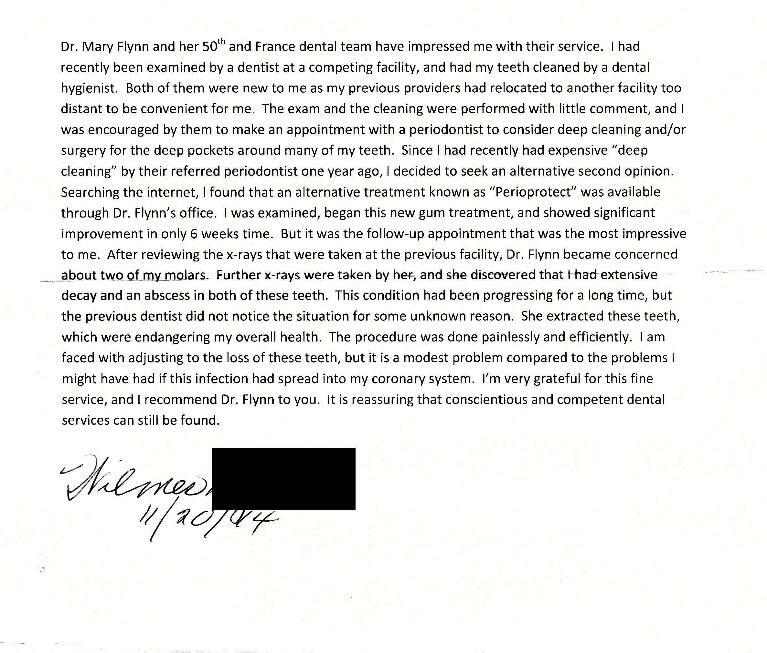 Since I had recently had expensive "deep cleaning" by their referred periodontist one year ago, I decided to seek an alternative second opinion. Searching the internet, I found that an alternative known as "Perioprotect" was available through Dr. Flynn's office. I was examined this new gum treatment, and showed significant improvement in only 6 weeks time. But it was the follow-up appointment that was the most impressive to me. After reviewing the x-rays that were taken at the previous facility, Dr. Flynn became concerned about two of my molars. Further x-rays were taken by her, and she discovered that I had extensive decay and an abscess in both of these teeth. This condition had been progressing for a long time, but the previous dentist did not notice the situation for some unknown reason. She extracted these teeth, which were endangering my overall health. The procedure was done painlessly and efficiently. I am faced with adjusting to the loss of these teeth, but it is a modest problem compared to the problems I might have had if this infection had spread to my coronary system. I'm very grateful for this fine service, and I recommend Dr. Flynn to you. It is reassuring that conscientious and competent dental services can still be found. Thank you for holding and cuddling with me yesterday while my mom got her teeth cleaned. I love it when she smiles at me with her sparkly white teeth! Thank you for the thoughtful attention and kindness. You Made One Of My Dreams Come True! Words cannot express how incredibly grateful I am to you & your wonderful staff for making one of my dreams come true "my new teeth"!!! I absolutely love them & your kind heart for helping me out!! I believe & know in my heard God has wonderful plans for His children And now I get to fulfill His plan for me with a smile on my face!! May the Lord bless you & keep you safe in all that you do - SEE YA MONDAY!!!! God bless you & your staff!